Stamping as Fast as I Can! Welcome to our From the Heart Stamps blog hop! This month we have a "I'm no Spring Chicken" theme which is perfect for all us Birdbrain lovers. 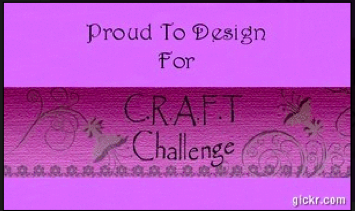 Our designers are each showcasing a project created with this theme in mind. If you have arrived from Angela's blog, you are in the right place. If not, how about starting on the From the Heart Stamps blog so you won't miss any of the fun. Now, head on over to the very talented Calypso's blog to see what wonderment she has created (is that a word, but you know what I'm talking about, right?). As you hop along, leave a comment on each blog. We will select a random winner from the comments on each blog and on the FtHS blog to win one image of your choice. Our hop will end on Sunday, April 9, 2017 at 6 am EST and the winners will be posted on Wednesday April, 13. Thanks so much for hopping with us today. I pray your week is full of blessings! Such a sweet pretty card! Brenda, this is so darn cute and Spring-y! Love the soft, pretty floral paper and I see that Lawn Fawn border die falling into my cart...LOL And of course, I am loving the glitter! Beautifully done, teamie! This is adorable, Brenda. Great Spring colors and glitter! How fun. Love the cute pink chick and all the fun spring colors. I love the bits of glitter! Isn't it great what we can get away with while making a card? like a pink chick? Love the borders on the card. 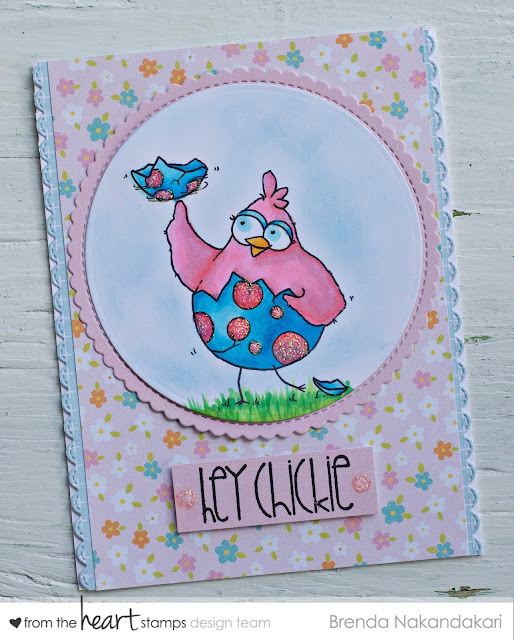 Very pretty background papers, with all the pastel colors, and your little chickie is adorable with the scalloped frame! Pretty papers and I really like that extra bit of sparkle on your card. Love! Gorgeous coloring...I love the pastel colors! I love this card! Beautiful floral pattern and the font is awesome. Plus, I always love glitter. How cute! This is super dooper sweet, Brenda. I adore the pink birdbrain. LOve the sparkle and the gorgeous color combination. You can never go wrong with Birdbrain! Such a sweet and fun card. How weird? I almost used that image this time, and I printed out the same EP papers ready to use too. I had a last minute change of heart on both choices, but we could have had very similar cards this time otherwise lol. This screams out 'Spring', loving the sweet, soft colours, and of course the added glitter! Wow, great minds, right? I can't wait to see you color her up! How cute Brenda! Love the colors too! Love the colors on this super fun card! Darling Card, Brenda and the soft Colors are fabulous. Beautiful card, love the image as with the broken egg. The glitter is a great addition and love that you made her pink! This is adorable! Love your colors and fun design. Oh wow! Too sweet and cute!!! Fun card! Love the layering and colors! Love it Brenda!!! Love the colors and the beautiful layout!! Sorry i am late visiting, but it has been one crazy week! I especially love the papers you used with the image. So pretty. Thanks so much for stopping by. I would be happy to hear your thoughts or answer any questions. I pray your day is full of all you love! I love crafting of all kinds. I claim it's cheaper than therapy, but not so sure that's true. So many wonderful products, especially stamps, that's why I'm stamping as fast as I can! Thanks for following my creative adventure!